Let’s skip back to 2016 when I signed up for Waldo 100k. I did it almost on a dare from a friend who said it was a great race and I should do it. I never considered myself a long-distance runner and thought 50k was long enough to call myself an ultrarunner. When I signed up, I figured if I got in, it was fate for me to try it. Well, they drew my name and I decided to go for it. On race day, it was 108 degrees in Portland for the hottest day on record. 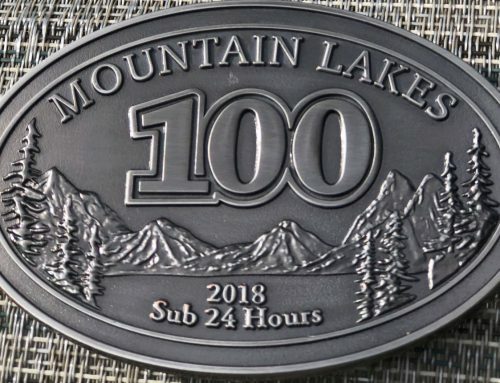 I struggled my way to the finish line in 16:37, but I finished and figured I could check 100k off as an accomplishment and never have to do another one. After a conference in San Francisco last year, I decided to spend an extra day and go for a run in the Marin Headlands out of Muir Woods. 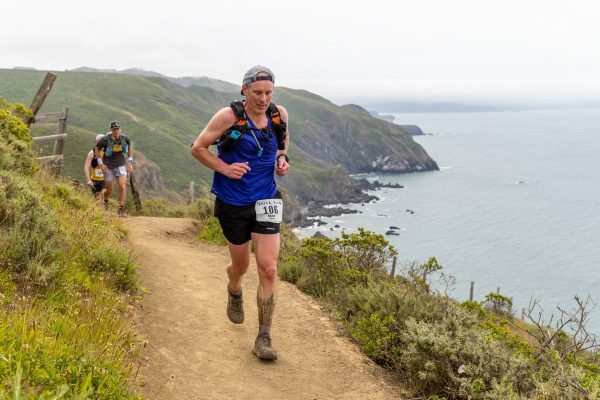 I knew a couple people that had run Miwok 100k and raved about the course and thought I’d try the trails out. On my 12 mile run, I ran through a redwood forest, fields of spring flowers, dense fog, and magnificent views of the Pacific Ocean. 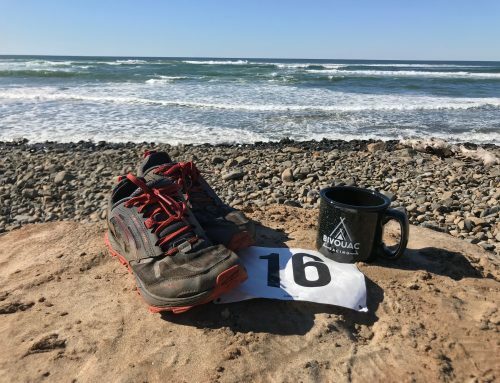 The run got the wheels turning to run Miwok and try another 100k, so I decided to put my name in the hat for 2018 and I happened to get in. Leading up to the race, I decided to concentrate on hill climbing instead of miles. When I ran Waldo, I felt like my climbing was easily my biggest weakness and wanted to improve on it. I also changed my nutrition to a high fat, low carbohydrate diet. I’ve been eating this way for over a year and now felt I was fat adapted. 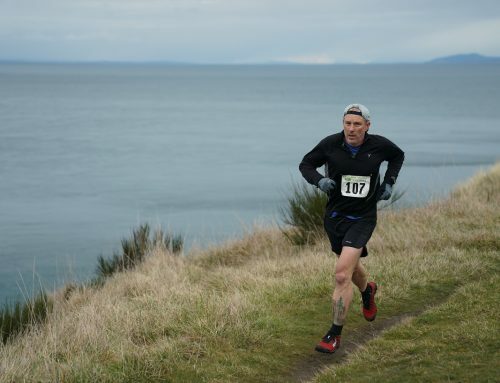 My last three 50k races and my training had been my strongest since I started trail running. 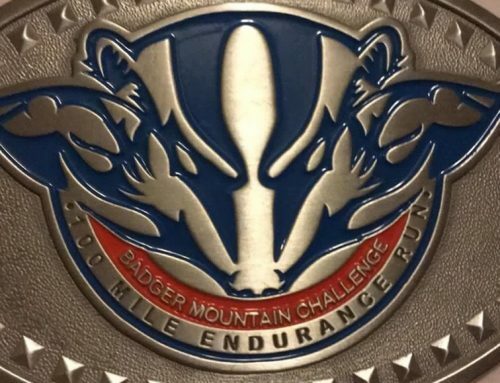 I ran Peterson Ridge Rumble 20 mile a month before the race and improved my time from a year ago by 16 minutes. Two weeks preceding the race, I caught a nasty cold. The Friday before Miwok weekend, I had a fever of 101. My wife and I had a serious talk about me not running. I started feeling better Thursday, two days before the race and I decided to go for it. I should also add that Shane Kroth had originally decided to crew and pace me for the race. Shane got injured before Miwok and couldn’t pace me the last 13 miles but still volunteered to crew me. Shane ran Miwok last year and had a great race, so his beta would be valuable. Shane and I flew down to San Francisco on Friday, the day before the race. We met up with fellow Oregonian Katie Christianson and drove to Mill Valley to pick up our bibs at the San Francisco Running Company. Shane and I had dinner with one of my high school and college friends where we drank a couple beers and then hit the sack early for a 3 am wake up. Shane dropped me off near the starting line around 4:30. I checked in, took a few pictures, met up with some running friends and was ready to go. I started my watch and the first setback had already started. My Suunto Ambit 3 Peak refused to find a GPS signal. I stared at my watch, waiting desperately for it to get started. This had never happened before! All of the sudden we started running. There were no instructions, countdown, horn or anything. We just started running. Or so I thought. About 100 yards into the race, we stopped, and herded ourselves like cattle onto the famous Dipsea Trail stairs. It was slow climbing for the next 2 miles. My watch still would not find a signal. Eventually noise from the bagpipes at the top of Cardiac hill was heard and I knew the 2.8-mile climb was over. I still had no signal, so I asked PK, a runner from Redwood City whom I just met, what our pace was. He mentioned we made it at 15:10/mile pace. I was surprised it was that fast since it was mostly climbing with a lot of stopping to get to where we were. My watch still didn’t have a signal after another mile on the descent, so I hit the stopwatch. This activated the step counter, so I at least had an estimated mileage and pace now. As we headed downhill toward the Muir Beach aid station, the earth’s rotation toward the sun created majestic hues of red, orange, and pink over the Pacific Ocean’s horizon. I tucked my headlamp into my Patagonia Strider shorts hip pocket and enjoyed the surroundings while conversing with fellow racers. Just before the aid station is Heather Cutoff trail. The trail is one switch back after another and the conga line started as the pack of runners slowly made it down. Fellow Portland Jacob Rothstein was just ahead of me and shook his head and I could do nothing but laugh. We still had a long way to go. We entered a small field to a down and back that the runners go in and out of the aid station. This gave everyone a chance to see who was just ahead or behind us. At the aid station, I filled my handheld with water, ate one of my three GUs in my pocket. I have only used gels over the last year in races just before climbs to help with glycogen depletion. I followed up the gels with watermelon and bananas. Just as I was about to leave Muir Beach, in came Katie. She was just a minute or two behind me. I left the aid station and started the three mile and thousand-foot climb. On the way out, I saw Anne Crispino-Taylor entering the aid station. This was Anne’s ninth Miwok, so I felt OK with the pace since we were so close. Thirteen miles into the race, Katie and I entered the Tennessee Valley aid station. This is the first time I saw Shane as my crew. He took my headlamp and told us we were looking good. Shane mentioned I was ahead of our friend Jeremy Long. I was confused since I know Jeremy is much faster than me. Shane then told me Jeremy didn’t make the start because of an accident on the highway just North of the race. I later found out that around 50 runners missed the start of the race because of a downed telephone pole caused by a teenager falling asleep at the wheel on HWY 1. These runners had to surrender their bib once they got to the start. Many ran the course anyway. Shane told me about the climb on the way out the Aid Station. I finished my Stroopwaffle, grabbed some watermelon, and headed out. I left the aid station slightly ahead of Katie and started the climb. I was climbing much better this time, at least compared to the other runners. The climb was only about a mile long, but I was actually passing people on this hike! Katie caught me just as we got to the top. At this point, we started seeing runners coming the other way. Are they in the race? I noticed the bibs and figured out they were already seven miles ahead of me. The Golden Gate bridge and the city started coming into view, one of the many magnificent vistas along the course. The rolling hills led us into the Bridge View aid station at mile 18. A downhill was waiting for us and I was ready to get out of the aid station quickly. As I filled up my handheld, Katie went to the bathroom. I grabbed some more watermelon and bananas and started walking. Just as I was leaving, Katie jumped out of the women’s room and was ready to go. We started running downhill for what was probably the fastest section of the course. I asked Katie what the overall pace was now, and it was close to 11:30. Whoa! That was way faster than I anticipated. I thought I should let up a little. Anne then caught us. Anne was feeling good. She and Katie started running slightly ahead of me. I started preparing for the next climb coming up and took another gel. At mile 20, we crossed a road and began the next hike. I was feeling good on the hike and eventually met with Katie and Anne again. We got to the section where we saw the leaders seven miles ago and then started heading back to the Tennessee Valley AS for the second time. This was another very runnable downhill. Anne dropped the trailer and started screaming down hill. Katie pushed at a slightly faster pace than me. I started feeling a slight pain on the outside of my right knee. This was a new pain that I’ve never felt before. I started wondering where it came from and hoped it would go away soon. We got to the horse stables just before the second Tennessee Valley aid station. Runners are forced to walk through the stables. Shane was waiting for me and started walking with me to the aid station. I landed at mile 26 just slightly over 5 hours. This was still much faster than I anticipated. I switched out the hand held for my Orange Mud Endurance hydration vest. I took a little extra time getting more nutrition. Shane made sure I was eating. Jeremy was also at the aid station. We talked about the accident. Jeremy said he was running the course with some friends. He seemed like he was in a good mood considering he couldn’t officially run the race. I started to leave when Shane mentioned he may not be able to meet me at Randall aid station due to the pole still on the highway. So, I grabbed my last GU, Trail Butter, Skout bars and stuffed them in my pockets. Katie was still at the aid station and was ready to head out with me. We took off and headed toward the up hill. Katie told me this was her favorite part of the course. As we reached the peak, I could see why. Just below us was Pirate’s Cove. There were several day hikers in this section enjoying the nice weather and view. This was, however, probably the hardest section to run. The pace was slowing quite a bit due the hills and the technicality of the trail. Weaving in and out of hikers also didn’t help. Katie started pushing ahead of me as we hit some stairs that went straight down into Pirate’s Cove. We dropped 300 feet in a quarter mile. My knee started acting up again. This is the first point when I thought this could be a long second half of the race. As I entered Muir Beach aid station again, Katie was just leaving. I don’t think she even saw me. I thought I’d take a little more time at the aid station, considering I still had 32 miles to go. I felt like I ate the whole plate of watermelon and drank a gallon of water. I also ate another stroopwafel as I knew the biggest climb was coming up. I was feeling tired, but at 6 hours, I felt good about the time and pace of the race. I took off and deemed I was just shuffling out of the aid station. I started singing in my head “The Harlem Shuffle” by the Rolling Stones. Except I changed Harlem to Darden. “Hey, hey, hey, do the Darden shuffle.” I laughed at the ridiculousness of this. Remember Heather Cutoff that we ran down earlier? Well now it was time to climb it. I started the up the first switchback and a couple runners immediately passed me. My new friend PK came by and asked me how I was doing. “It’s going to be a sufferfest.” I replied. “Just work from aid station to aid station”; said PK. That was hard to do considering I knew I had around 30 miles to go. Something happened though, the hiking became easy. My legs weren’t hurting at all on the hike and I started passing people at what seemed a reasonable effort. I worked my way toward Cardiac aid station feeling strong. Just get to Cardiac and it will flatten out. I started passing more and more and eventually passed PK and even Katie just before the aid station. 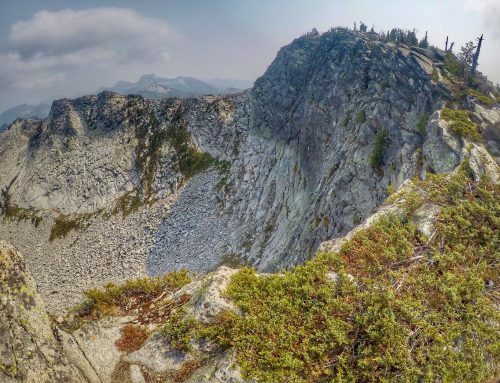 When I got to the aid station, all the sudden I felt myself bent over and breathing heavily. Did I work that climb harder than I thought? I ate a Skout bar, some watermelon, and drank lots of water. Anne met us at Cardiac. She and Katie were ready to go and I decided to leave with them. There was still a little more climbing until with started on the rolling single track of Bolinas Ridge. This section is full of wildflowers. Katie pointed at a flower. “That’s a California Poppy, the state flower of California.” Wow, cool! It’s nice to know that I’m not the one that’s spilling out trivia on runs. The exposure of the ridge seemed like it brought the temperature up 20 degrees. I was feeling hot and my mouth felt dry. I took my first swig of Dark Chocolate and Coffee Trail Butter. My local running store was out of my usual Maple Syrup and Sea Salt flavor. I immediately felt nauseous as this flavor didn’t seem to agree with me right now. I slowed it down and let Katie and Anne pass me. Anne was looking strong and surged ahead, while Katie was still within view after a mile. Coastal Trail is a single track that winds through grass fields along the ridge offering great views of the ocean. The leaders of the race were now coming at me. When a runner came through, I stepped off the trail to allow them by. Each time I stopped, I felt cramping in my calves and my back. I started slowing again, trying to get myself out of this funk. Runners started passing me from behind as well. Eventually I decided to let a large pack of runners by. As I stood off the trail, my left calf completely locked up and I fell to the ground. PK happened to be in this pack and he stopped to help stretch it out. Another runner not in the race pushed my toes toward me knee, trying to free up my lower leg. I told PK not to worry about me and get going. 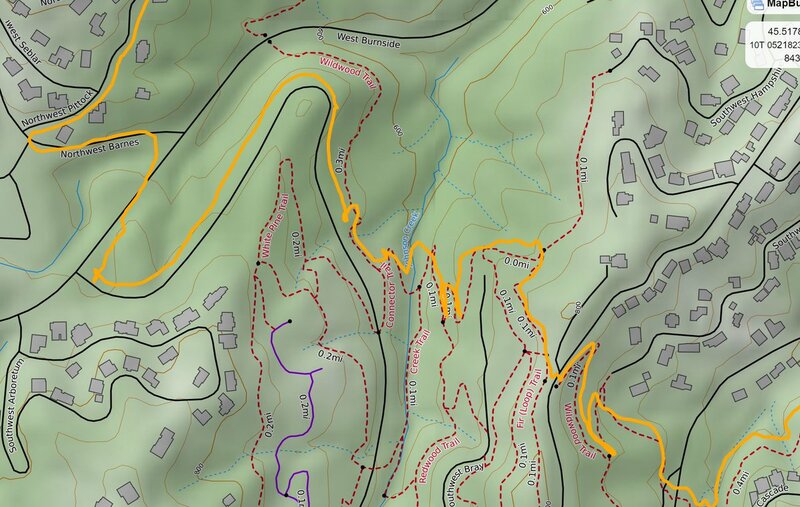 After a few minutes, I got up and started walking toward the Bolinas Ridge aid station. I had 4 miles to get to Bolinas Ridge. My head now was full of negative thoughts. I determined I’m not an ultra runner. This was going to be my last race over 50k. Ultras are stupid anyway. Occasionally, I would run for maybe 100 meters and start walking again. I felt like this was a funk that I could not get out of. I eventually limped my way to the aid station. A volunteer immediately asked me what was going on. “Cramps in my calves.” He found a chair for me to sit in and immediately my right calf locked up. He lifted my foot and worked it out. As I lowered my leg, it locked up again. We repeated this motion for 5 minutes until the volunteer grabbed another chair and set my leg on top of it. “What do you need?” he asked. I threw my low carb diet out the window. “I’d love some ginger ale.” I drank 3 cups of ginger ale, hoping it would help my stomach. He grabbed me fruit and saltines and I ate it all. At that point he left me alone and started helping other runners. I thought about dropping here, except were two problems with that. I knew Shane would be waiting for me at the next aid station and there was no way to communicate with him. I also knew that it would be hours until I could leave with a volunteer. I started shivering from sitting in the shade for around 20 minutes. I had to get out of there. I struggled to get up. “He’s up!” the volunteer exclaimed. I grabbed some banana chunks and left the aid station. “Hey, hey, hey, do the Darden shuffle” was running through my head as I started jogging to get my body warm again. Eventually the trail entered sunny spots and I started to warm up. Albeit very slow, I was running again, and I was happy about that. I think I was the slowest person on the course. Runner after runner would pass me. I figured I was going to miss the cut off at the next aid station. I convinced myself that I’ll be satisfied with a 49-mile run after having a bad cold. Around a corner on a downhill, a woman who just passed me was on the ground. A runner coming from the other way helped her up. “Do I look OK?” she asked. “I hit my head on the ground.” Both of us said there was no blood. She cursed at the root she tripped on and all of us kept going. She cruised right pass me as we came up to the turn to Randall trail. “One point six miles to Randall aid station.” the volunteer said as I started the 900-foot descent. I slowly made my way down the hill. My right knee was really hurting now, which made stepping over each rock and root difficult. I saw Jacob coming up the hill and told him about my cramping. He offered some electrolytes, but I had just taken a salt tab. Anne met me as she climbed up the other way. “How are you feeling?” she asked. “Not good” I replied. “I’m going to quit up here.” I felt guilty telling Anne that. “Shane thought you went off course. I’m sorry you’re not having a good race.” PK approached me, and said that Katie had saved him with some gel blocks. I told him I was going to drop because I wasn’t going make cut-off. He assured me I was way ahead of the cut-off and I could make it. My attitude started changing. Maybe I can do this. I’m not cramping anymore. Katie followed PK by a few minutes. PK had told her I was cramping when they met earlier. She told me how happy she was to see me and that I was going to finish. She seemed more confident than me. Shane had spotted me as I slowly trotted toward Randall aid station. TJ Ford was with him. TJ had to drop at mile 13 because of a bad fall that split open her knee. Shane offered to pace me the rest of the way, despite not running for several weeks due to his injury. “I just ran 14-minute miles going downhill. I don’t think you’ll have a problem running with me” I told him. Having Shane offer to pace me boosted my spirits. TJ let me know I had 40 minutes before the Randall aid station cut-off. There was no way I was going to drop now. TJ served me some ginger ale and broth while Shane changed his clothes and registered as a pacer. Shane wore my Orange Mud pack and I switched back to my handheld bottle. Eventually Shane and I took off to finish this thing. Shane and I started the hike and I passed a runner. I hadn’t passed anyone for over 10 miles. Shane started a challenge. “Let’s pass ten runners.” Maybe it was the fact that Shane was wearing cargo shorts or the thought passing ten runners was impossible, but I just cracked up. My hiking felt stronger and stronger. I passed another runner. Maybe we can do this? Shane’s watch beeped at one mile. “How fast was that?” I asked. “Eighteen minutes” he replied. OK, not burning, but not bad considering it was a steep climb. When we got to the top of the hill, Shane made sure I got something to eat. I grabbed my Skout bar and started munching away. My mouth was so dry I had to take a big swig of water just to get it down. I ate half of the bar before I realized I would have to drink the whole bottle just to get it eat the whole thing. I tossed the rest of the bar and started running. Shane and I hiked up any hill and ran everything else. Each mile was slightly faster than the last one. I started picking off runners one by one. I’m usually not that competitive in trail races, but Shane seemed to give me some motivation and it was working. We passed at least 10 runners before we arrived back at Bolinas Ridge aid station. I saw the volunteer that helped me with my cramps what seemed like several hours earlier. He looked happy and a little shocked to see me. I shook his hand and told him thanks for helping me out and I’m going to finish this thing. They were out of ginger ale, so Shane made me drink a Coke. I haven’t had a Coke in years and it immediately made me nauseous again. I grabbed a couple banana chunks and started walking out of the aid station. I handed the peels to a volunteer checking bib numbers and headed toward the finish line. We had already completed Shane’s pass ten runners challenge. I started doing the math in my head. If I can do 13-minute miles the rest of the way, I can get under 15 hours. I had my new challenge. At this point, I was basically running and hiking as fast as I could. We did a couple miles around 12 minutes. We were passing runner after runner. Shane was slightly in front of me and noticed Katie was ahead of us. We slowly started catching her and a couple other runners she was with. We came to a bend in the trail and saw each other and I gave her a wry smile. Katie talked about awesome it was for Shane to be pacing me and ran with us as we caught up. I felt bad when I asked to pass her because I was thinking of getting that sub-15-hour time. We started to gap Katie as we approached the Matt Davis trail downhill to the finish. Shane proceeded to tell me I needed to run the last 2.3 miles in 30 minutes. Since I could barely lift my right foot up due to the knee pain, I knew running that fast on the 1500-foot technical descent was going to be tough. I slowed to a crawl each time I had to step down a stair or over a rock. We came to a detour that sent the trail straight down on some thick dirt. It must have taken me a minute to go down the 20-foot detour. We climbed over several downed trees and branches. I ran as hard as I could when I could, but I knew I was slow. For the first time since Shane and I left Randall, a runner passed me. Then another one. Shane said do what you can to keep up with them. I tried, but to no avail. As we trekked down the switchbacks, Shane proclaimed. “Hey there’s Katie.” I was concentrating too hard to even look. Shane was counting down the distance the whole descent of the Matt Davis trail. I had to make the runnable last quarter-mile in 2 minutes and I felt like I went to an all-out sprint. As soon as I spotted the finishing clock, I noticed the first number said 15. Dang, just missed it. Shane slapped my back and said great job as I made my way across the finish line. Official time: 15 hours and 37 seconds. I got my medal and noticed Katie finishing right behind me. Jacob, Anne, PK, and TJ all offered me congratulations. I was relieved to be done. It took about an hour to get out of there and make it back to my friend’s house in Mill Valley. We celebrated with beers and a shot of tequila (it was Cinco de Mayo) until 1 am. I woke up the next day with a sense of accomplishment and a burning question running through my head. When’s the sign up for 2019 Miwok? Congrats Shane! I am friends with Katie and one of the runners who missed the start due to the downed power line. I loved reading your race report! I can’t wait to run this race next year. Thanks Amy. Sorry about missing the race. You’ll have a blast next year!